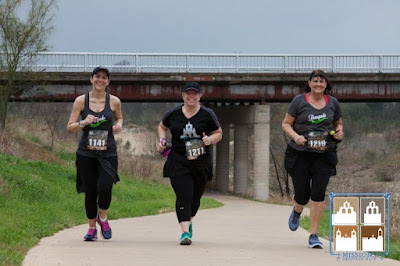 My Journey to Fit: WWU - Race Pictures! Waiting to see official race pictures is always an interesting thing - on the one hand, you hope for something good, but on the other hand, once you've seen your first batch of race pictures, you realize that timing is everything with them - if the photographers get you when your foot is pushing off rather than landing, you look entirely different...and not in a good way. 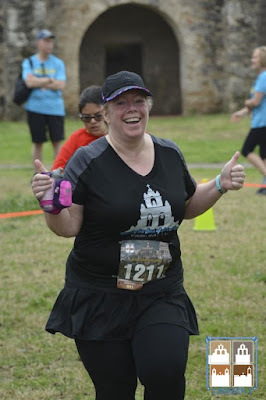 I remember, several years ago, a runner posted pictures from different angles and she went from looking amazing to looking like a lump of goo, which made me feel a bit better about my race pictures. 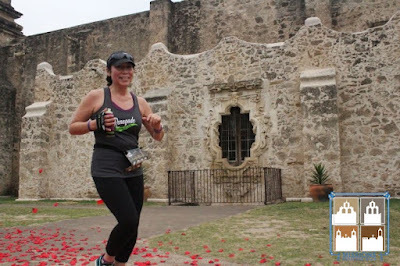 So I've worked to adjust my expectations of the official race pictures over the years, and at this point, I hope to get one, just ONE, where I look halfway decent. With that preface, I present to you my race pictures from the last two races I ran. 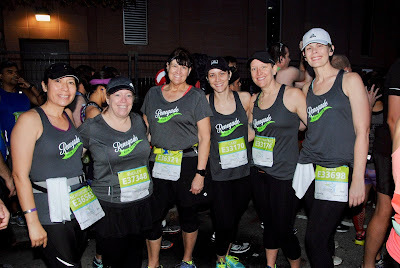 My running peeps, in the corral before the race. I made prints for everyone, so we all have a good picture of us looking nice before the sweatfest began. My finisher picture - you can't really tell from this shot that I had spent the last mile running in a full-on downpour. Very happy and proud runner here - half marathon #10, done. Next up are pictures from the Missions Heritage 10,000, which are all free - yes, FREE. It's just another nice perk that the race organizers give their runners, and I really appreciate that, being the picture-lover that I am. Julia, with the rose window in the background. Me...check out the woman behind me - it's impossible to not run through a shower of rose petals without feeling like a superstar! Even the monk couldn't resist! I love this picture! Smiling faces, conquering that hill. OK, there was some cussing along the way, but we look strong here! Finish line - boy was I happy to get there. After all of these race pictures, I don't have a long run to recap for you because Jeff and I played hooky last weekend and went to Dallas to visit Allie, so no running for us. I still got my weekday running in, though. 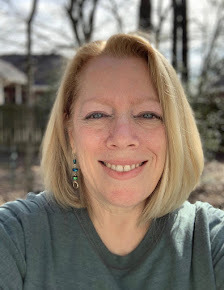 I'll be back on track this weekend - Diane has 16 miles on tap, so I'll be running part of that with her - not sure how much, but it will be an adventure, no doubt. 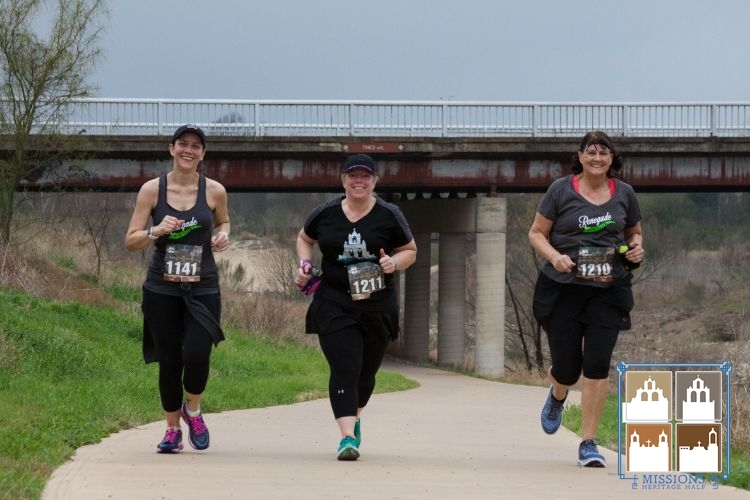 Wow, you got some great race pictures! You certainly don't look like you ran in the rain in that first one! You can tell because the shirt is so dark...but yeah, you couldn't see the water dripping off of my clothes in that shot. In all the races I've run, I've yet to have a great or even good official race photo. Little Helen took one of me at the second MCM I did and it's one of my favorites. 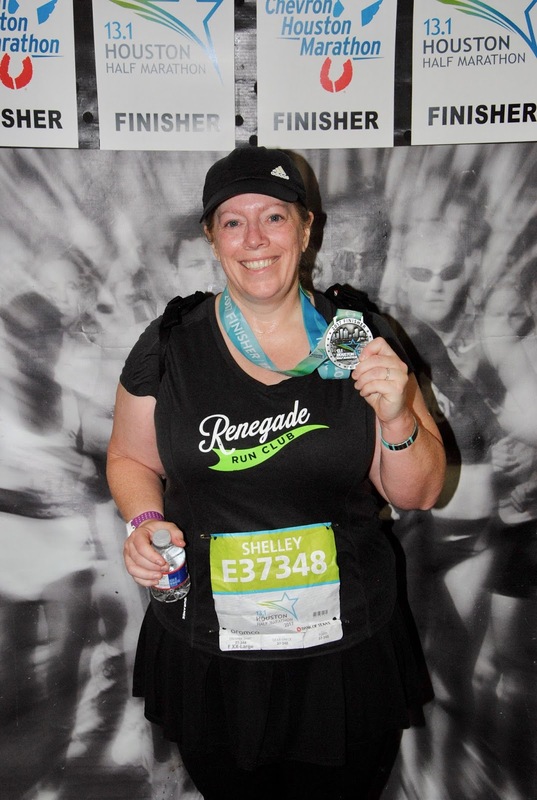 I don't do much racing anymore so maybe good race photos have passed for me, but that's o.k. 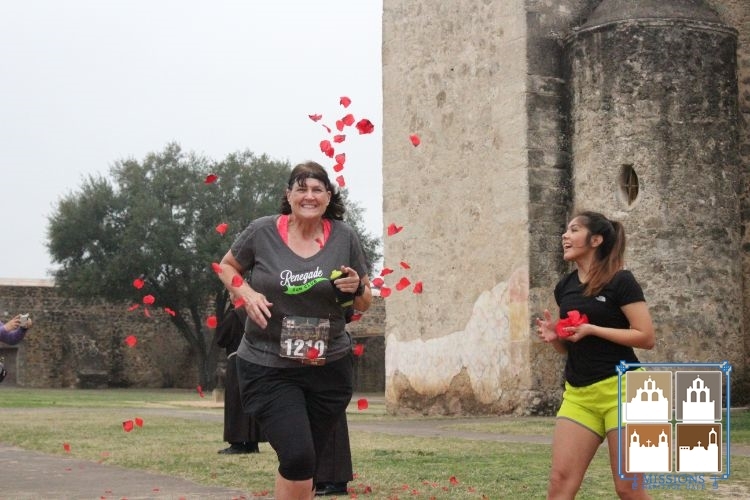 Yours from the Missions race are just great! I have some good ones; I've learned to discount the body and take note of the facial expression and that's when I can love the pictures more. I somehow missed Monday's post! Glad you got to spend time with Allie and that Paco came along - somehow Hannah's dogs know if they are going to the vet vs. Starbucks to get puppy whip! Great race photos! I usually will buy one. For my marathons tho, I buy the whole package. 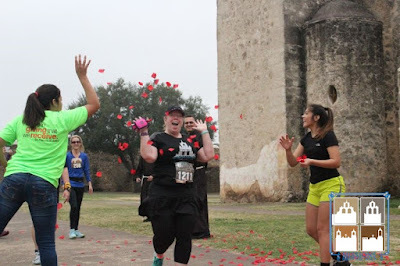 I like to have the pictures to look back on...I get runner's amnesia during the longer races, so it's nice to see what I actually did, LOL. 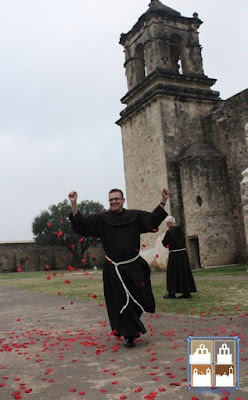 The pictures of you all running through the roses are so fun, especially ending with the monk running through. But that photo of the three of you running up the hill is just super. To get all of you looking good at the same time seems really lucky! Great photos. You guys look like you are having so much fun.. I think it is a no brainer that y'all HAD to run through the rose petals separately for optimum picture opportunity!!!! Wise choice and awesome pictures!!!! Your finisher picture looks almost like you are in the Millenium Falcon at hyper drive.! 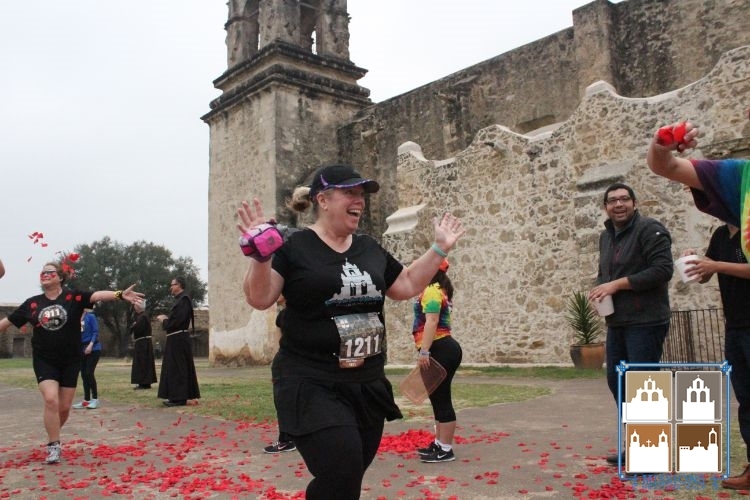 I know, that Houston finisher picture is funny - I think it's supposed to look like I'm beating everyone in the background? That is awesome! I just started trying to run some again. I started at 191 lbs and I've lost 16 lbs so far, but still have about 30 lbs to lose to meet my initial goal. Right now, I can only run about 2-3 minutes at a time before I have to walk for a minute. I do that for about 1 1/2 miles two days a week and walk my dog for 1 mile 3-4 days a week too. 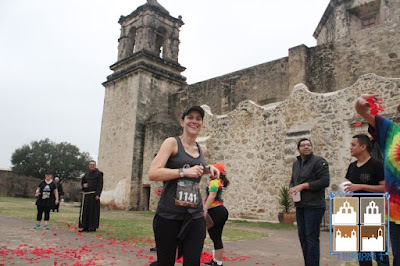 First time I tried running in 2012, I did the Couch to 5K and ended up with a stress fracture to my left ankle after only 8 weeks and then was out of activity for 6 months. I carry most of my weight in my upper body, especially my stomach, so it really puts a strain on my little legs. So here I am trying it once again on my own terms and starting off and going very slow. Your weight loss journey and your running are an inspiration and encouragement!